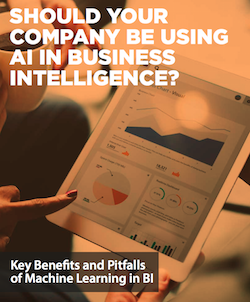 Our latest report is an in-depth look at how artificial intelligence (AI) is being used to enhance business intelligence (BI) and other data analytics. If you want to stay at the cutting edge of technology and maintain - or gain - advantages thanks to BI, AI is something that needs to be on your radar. AI’s ability to quickly and efficiently find patterns in data is a game changer. To learn more about how your business may be able to benefit from AI moving forward, read the report now.